Is there anything better than warm toasted banana bread and coffee for morning tea? 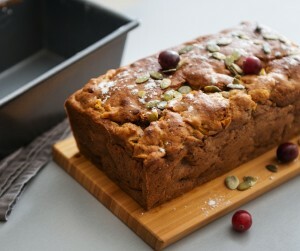 If this is your happy place too, you’ll adore this healthy version of banana bread with a crunchy pumpkin seed topping. With less than half the fat, 40% less sugar, and three times the fibre, it’s all the yumminess… without the sugar crash afterwards. Method: 1: Heat oven to 160C fan forced. Grease and line a loaf tin with baking paper (allow it to come 2cm above top of tin). Mix the flours, bicarb, baking powder and a pinch of salt in a large bowl. 2: Mix the bananas, syrup, eggs and yogurt. Quickly stir into dry ingredients, then gently scrape into the tin and scatter the top with with pumpkin seeds. Bake for 1 hr 10 mins-1 hr 15 mins or until a skewer comes out clean. 3: Cool in tin on a wire rack. Serve.